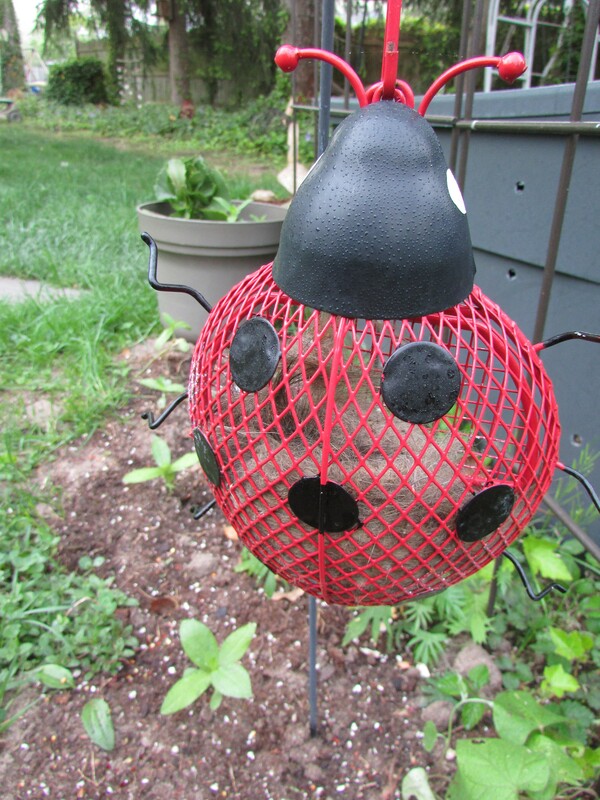 This ladybug suet feeder never quite worked out as I hoped, with no easy perch for landing it was shunned by the birds. Instead of throwing it away, I filled the suet feeder with strands of cat hair, courtesy of the fur my cats shed when I brush them each day. The suet feeder seems to be doing the trick so far. I’ve also sprinkled a few red pepper flakes among the newly planted seedlings and this seems to be helping too. If you don’t have cats you can use smashed garlic cloves, onions, citrus essential oils as repellents. Filling a suet holder with cat hair definitely makes this photo worthy of Cee’s Oddball Challenge. That’s great that you could find a use for the suet feeder. Love the photo! Is it oddball rather than hairball? Laughing as I write this…great pun. Marvelous odd ball for this week. 😀 Sorry it didn’t work out, but it is a great lawn ornament.